Rkhd1, also known as TINO or MEX3D is a member of a novel family of four homologous human MEX3 proteins each containing two heterogeneous nuclear ribonucleoprotein K homology (KH) domains and one carboxy-terminal RING finger module. MEX3 proteins, including Rkhd1, are phosphoproteins that bind RNA through their KH domains and shuttle between the nucleus and the cytoplasm via the CRM1 export pathway. These proteins are a novel family of evolutionarily conserved RNA-binding proteins, differentially recruited to P bodies and potentially involved in post-transcriptional regulatory mechanisms. Rkhd1 binds to the AU-rich element in the 3’-untranslated region of Bcl-2 mRNA and is thought to be a negative regulator of Bcl-2 expression. Rkhd3 and Rkhd4, but not Rkhd1, co-localize with both the hDcp1a decapping factor and Argonaute (Ago) proteins in processing bodies (P bodies), recently characterized as centers of mRNA turnover. Western blot analysis of Rkhd1 in MDA-MB-361 cell lysate with Rkhd1 antibody at (A) 1 ug/ml and (B) 2 ug/ml. Immunohistochemistry of Rkhd1 in human small intestine tissue with Rkhd1 antibody at 2.5 ug/ml. 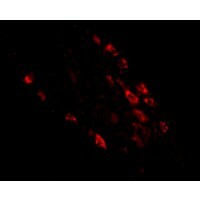 Immunofluorescence of rkhd1 in human small intestine tissue with rkhd1 antibody at 20 ug/mL.